Bill Would Expand Disclosure Of Political Money : It's All Politics Sens. Lisa Murkowski and Ron Wyden have sponsored a bill aimed at outing the wealthy donors, corporations and unions that financed some $300 million in secretly funded campaign ads last year. Initial reactions showed what the two senators are up against. Senators Lisa Murkowski, an Alaska Republican, and Ron Wyden, an Oregon Democrat, discussing their new campaign finance legislation at an April 23, 2013 Capitol Hill news conference. The partisan rift over disclosing political donors has widened since last year's election. But now, along come Sens. Lisa Murkowski, R-Alaska, and Ron Wyden, D-Ore., with a bill that would radically expand the disclosure of political money trails. Their bill is aimed at outing the wealthy donors, corporations and unions that financed some $300 million in secretly funded campaign ads last year. Most of the anonymous money was raised and spent by 501(c)(4) social welfare organizations, including the conservative Crossroads GPS and the liberal Patriot Majority. "It's not my intention, I don't think it's Sen. Wyden's intention, that anybody gets an unfair advantage," Murkowski said. "It's even-steven across the board." Current law goes two directions on disclosure, because two agencies regulate the political groups. Candidate committees, parties, political action committees and superPACs all have to disclose to the Federal Election Commission. But tax-exempt 501(c)(4)s, 501(c)(6) business associations such as the U.S. Chamber of Commerce, and 501(c)(5) labor unions have no disclosure requirements — or contribution limits either, for that matter — because they are regulated by the Internal Revenue Service. The bill would apply one set of disclosure rules, regardless of who's doing the spending, the senators said. One exception would be for "widely supported membership organizations" — groups that include the National Rifle Association and Sierra Club. They wouldn't have to publish their membership lists. And the one set of disclosure rules would be jointly written by the FEC and IRS. The new rules would cover what the bill calls "election-related activity" by the swelling ranks of independent groups, such as 501(c) organizations and superPACs. But the FEC and IRS have different approaches to defining "political activity." The FEC uses a "bright-line" approach: For instance, TV ad spending within 60 days of the general election has to be disclosed. The IRS uses broader definitions — vaguer, some might say — and it doesn't draw those bright lines. The bill would use the IRS approach. Democrats have tried to strengthen disclosure requirements since 2010, when the Supreme Court issued its Citizens United ruling. That decision gave corporations more latitude to play partisan politics. The decision endorsed disclosure, but did nothing to require it. Republicans on Capitol Hill are united against the Democrats' efforts; they say the Democratic bills have a hard partisan spin. Murkowski — who was re-elected as a write-in candidate in 2010 after being hammered by Tea Party groups — says she hopes her colleagues like this bill better, with its broad-brush approach to the issue. 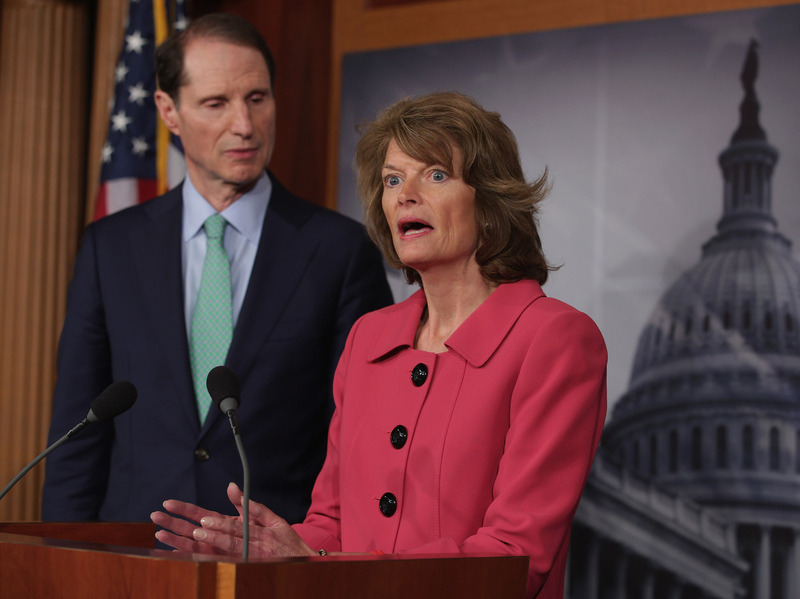 Initial reactions showed what Wyden and Murkowski are up against. The conservative Center for Competitive Politics says disclosure would violate the First Amendment rights of donors to the tax-exempt groups. And at the liberal group Public Citizen, lobbyist Craig Holman praised the senators for tackling the disclosure issues, but he said they're making a legal mistake by dropping the bright-line standard for defining election activity.